I think all kids get a little anxious about going back to school. What will their new teacher(s) be like? Will their best friend be in their class? It’s tough for all kids, and even their parents. But for a child with Autism, it can be even tougher due to difficulties around being able to express how they are feeling. My 13-year-old son loves school. But he’s showing signs of anxiety as we look ahead to school starting next week. He communicates with me mostly via text messaging, even if he’s sitting in the same room with me. He’s on a trip with his dad this week and will return the day before school starts. He’s thinking about school and what he needs to bring on the first day. PE happens to be his favorite class with his favorite teacher. Before he left, I told him I’d get his school supplies together, but I didn’t mention the PE shirt. He knows the first day of school, the Tuesday after Labor Day, is a half day. In this text, he’s trying to understand how he’ll get to school that day and also confirm that the next day, Wednesday, when the typical school schedule starts up again, he’ll be riding the bus to school like last year – and that it’s the same bus. With our typical kids, we can talk with them and help answer questions about the things they are wondering about, the things that make them anxious. But with my son, that doesn’t work. What DOES work for us, is using an electronic calendar. I set up an Outlook.com account for my son and then I shared his calendar with myself so that I could easily add information to the calendar directly from my Outlook.com account. When you share a calendar from one Outlook.com account with another, the other person gets an email telling them that the calendar has been shared with them and then this calendar shows up in their calendar list. When you share it, you can decide if the other person can just read the calendar or you can give them the ability to actually add items and change things. I keep my son’s calendar “turned off” most of the time so it doesn’t clutter my work schedule but when I need to add something, I can easily toggle it back into view, add what I need and it’s done. I’ve given my son a smart phone so he can text with me in order to communicate with me. But the calendar is our second method of communication. My son remembers schedules really well, AFTER they are established. But as we try to establish new routines, the calendar is key. Over this past summer, he went to camp with Outdoors For All. They schedule camps a week in advance with different activities everyday. 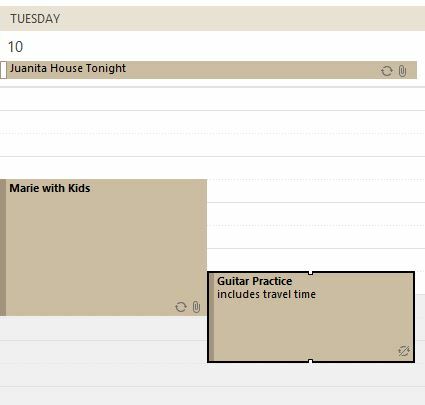 When the schedule is sent, I add the details to my son’s calendar, including things he needs to bring. For example, if they are swimming that day, he needs to bring a swim suit and towel, wear sun screen and remember to bring a lunch. If they are hiking, I add a note in his calendar to “wear hiking boots” and he takes care of the rest. The calendar gives my son a sense of control. And because I can let him know what is going on and add information about what he needs to bring to camp or to school, he gets the independence that he desperately needs to have, especially as he enters these teenage years. When schedules change or the routine has exceptions, this can also cause anxiety for any child, but especially children with Autism. I also use the calendar to help manage these changes. For example, my son has guitar practice every Tuesday evening with his step dad. 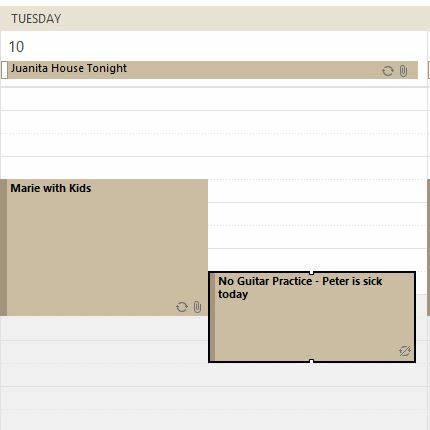 If the guitar instructor cancels due to illness, I go into the calendar and change the appointment from “Guitar Practice” to “No Guitar Practice – Peter is sick today”. My son checks his calendar after school. When he sees this, he knows the schedule has changed, knows what to expect, and there’s no issue. You may wonder, why don’t you just tell him that practice has been cancelled? With my son, it takes multiple times for a verbal message to register. And if the babysitter is the one passing along the message, for some reason, my son doesn’t believe her! But if it’s written in the calendar, he believes it. I know he needs visual aids to help him comprehend things. The written item in the context of this day and time in his calendar is how he understands the changes. When he was young, we started with visual schedules. This is a common tool for younger children with Autism. But as our son has learned to read and as his interest in electronic devices has grown, his schedule has grown up to be just like an adult who manages their work schedule in Outlook. And his ability to understand schedules may be one of my key tools to helping him be an independent adult someday. Posted in Autism.Tagged autism, back to school, Calendar, working parents.